Ever think to yourself, "All I want for the Holidays is a new house, and I want this crazy crew to help me with the process"? 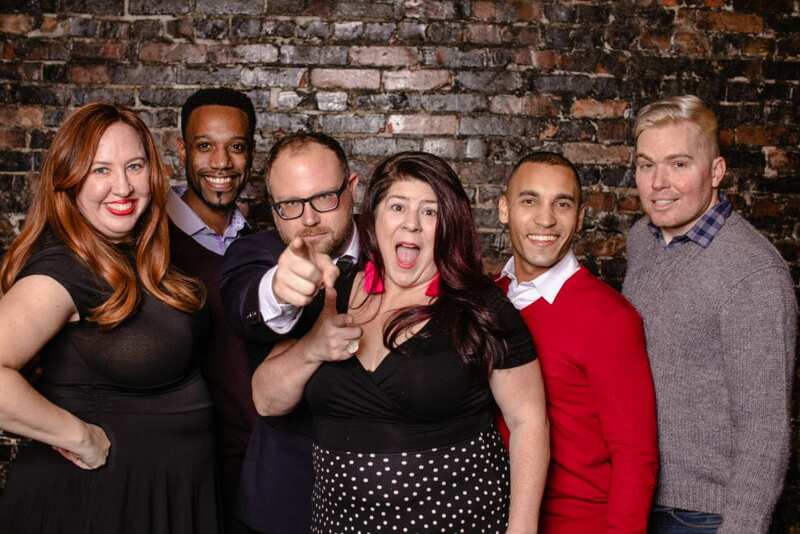 Well, this weekend this crew will be out in force helping you and others jump in on those Thanksgiving home sales before someone else realizes the good deals that are to be had here in Seattle. Join us for an epic Seattle Open Houses festival of goodness. Yes, on rare occasions we will leave the 206 for our neighboring counties. Specifically, if you are a rad person and manage to update an entire home. 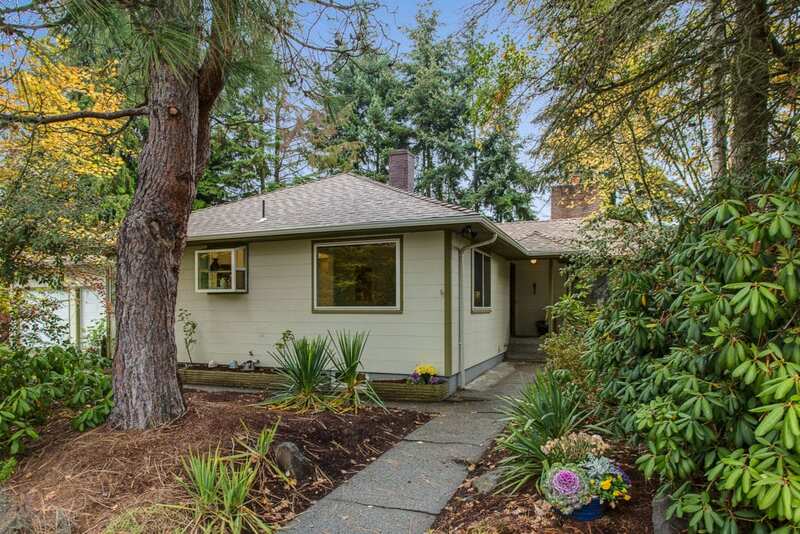 Let’s talk about some Seattle Open Houses and One in Everett. What better way to spend your Saturday than waking up late, cooking breakfast in your remodeled kitchen, taking a walk to Silver Lake, then reading a book while stoking your wood stove? Delightful! Welcome to the Woodside Community in Everett. Get ready to settle into this completely redone three-bedroom, two-bathroom condo in South Everett, with brunch on the deck and brand new flooring under your feet. The many updates include your own Bluetooth speaker system. Close, easy transit options make your commute a breeze. No rental cap. Super pet-friendly. What’s Going On in Everett? 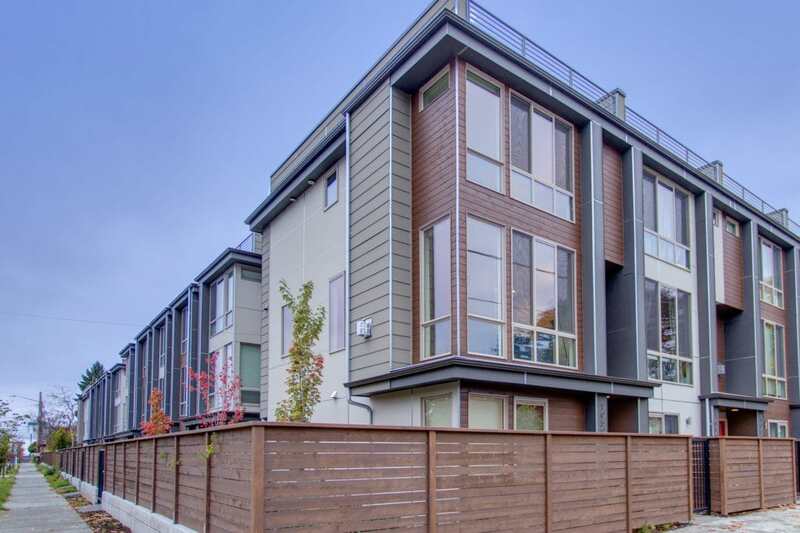 Have you been looking for a new construction townhouse in North Seattle? Here is your chance! This home was completed and sold in May of 2017 and now it can be yours. Walk in the front door to find two bedrooms and a full bath on the ground floor! This set up is perfect for guests, or a possibly conversion to a mother-in-law or Air BnB! The second bedroom has access to the parking at back. Upstairs, on the main level, you’re set to expertly entertain! This is my favorite floor and I’ll tell you why. This open kitchen, dining and living room layout is full of light from floor-to-ceiling windows. Cook MasterChef-worthy meals in this brand new kitchen, with all stainless steel appliances. After dinner, warm away that fall weather in front of the fire. It’s gas powered and turns on with the flick of a switch! Also, there is a half bath on this floor, so your guests don’t need to go too far to powder their nose. The third floor is where you’ll find a huge master suite with walk-in closet, separate toilet nook, and laundry at the end of the hall. There are also massive Eastern and Southern windows letting in tons of light, which is super necessary in these stormy Seattle seasons. No lack of vitamin D in this bedroom. One of my favorite things about this level is that the access to the rooftop deck is separate from the master suite, so your friends don’t have to see your messy bed. From the roof you’ll be able to see the Olympic Mountains, Downtown Seattle AND the Space Needle! All this, and you’re a quick jaunt to Greenwood and Northgate. Commuting to downtown is a snap via the Rapid Ride E line or one of the many buses available within a few blocs. In a few years time, the light rail will be down the street at Northgate! You’ll have easy access to all of downtown, as well as the airport. You can leave your car parked at home in its private parking spot out back. What’s Going on in North Greenwood? Rolling hills, picturesque Lake Washington and Cascade views, and unique modern homes…this is what you’ll find in Seattle’s Lakeridge neighborhood, one of the city’s best kept secrets. And this Marvelous Mid Century Modern is certainly unique. Its oak floors, coved ceilings, arched doorways and quaint built-ins are all original features of this 1940’s rambler. Beyond the delightful architectural details, this home also offers and amazing amount of space and a stellar layout. With a full bath for every bedroom, including a spacious master, and variety of gracious common areas, no one in your household will never want for privacy. Hunker down in the corner office on those telecommute work days. Cuddle up with your loved ones in the basement great room for Halloween movie marathon time. Or chill upstairs by living room fireplace with a good book. And when it’s time to entertain, you have options galore. Throw a dance party, a dinner party or quaint cocktail party. You’ve got the room! When the weather warms, the backyard and deck will be perfect spots for BBQ time. And if that isn’t enough space, there is the huge two car garage, complete with loft storage and a mechanic’s pit (oil change anyone?). Beyond the views and cool homes, this neighborhood has great access to the best of Renton and South Seattle. The downtown Renton Farmer’s Market is one of the best in the area, and you are just minutes to fabulous woodsy walks in Lakeridge Park or pool time at the Lakeridge Swim Club. Don’t feel like cooking? Just minutes up Rainier Ave you will find The Stonehouse Cafe and Pizzeria Pulcinella. 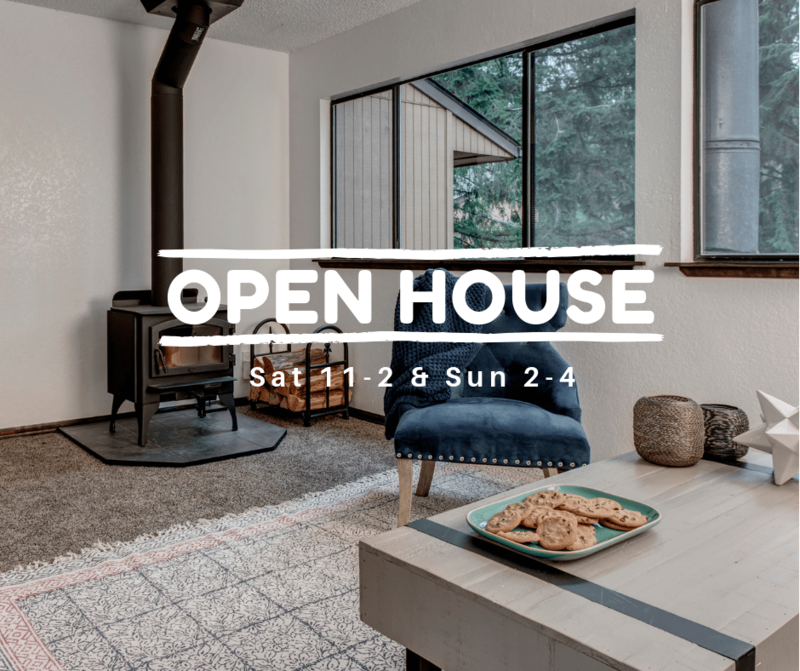 Come tour this Marvelous Mid Century home, and while you’re down this way, check out all the hidden gems Lakeridge has to offer. What’s Going on in Lakeridge? Experience the best of Capitol Hill living at the Plaza Del Sol in Seattle. This stylish and roomy condo offers two bedrooms, two full baths, and a fabulous private balcony deck, perfect for enjoying sunset Space Needle views while sipping your evening aperitivo. Speaking of your own deck, the Plaza Del Sol has one of the best rooftop decks in the city. The HOA is doing a huge renovation of the deck, with plans to expand it even further. Inside the home, you have an incredible layout and details that you do not find in a lot of buildings on Capitol Hill. That includes hardwood floors, huge closets and bedrooms, and a gas fireplace. The home is Alexa ready, with custom light switches and outlets. The open floor plan is perfect for entertaining your friends with treats from the Farmers’ Market, or for a simple game night at home. Have weekend guests from San Francisco visiting? No problem you have a Murphy Bed in your oversized second bedroom and your guests have their own bath. Take them on a party tour of the Pike/Pine corridor and in the morning make sure you brunch at Glo’s down the street. 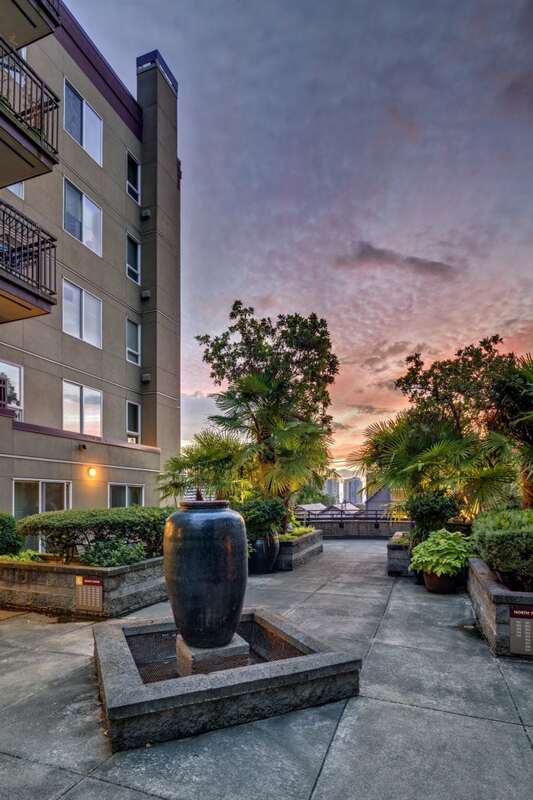 There are a lot of Capitol Hill condos for sale in Seattle right now, and the Plaza Del Sol has always been an excellent investment because of the care the owners have put into their building. It’s one of the few buildings in the city that is VA financing approved. It’s also super pet-friendly, with no weight or breed limit. There’s no Rental Cap for you investors, or for those of you who need to move in a couple of years. Condo Internet is available. Commuting is heavenly from this specific location on Capitol Hill. Leave your car parked in the garage with the Light Rail just a couple of blocks away. You will revel in wonderful Capitol Hill dining and nightlife. 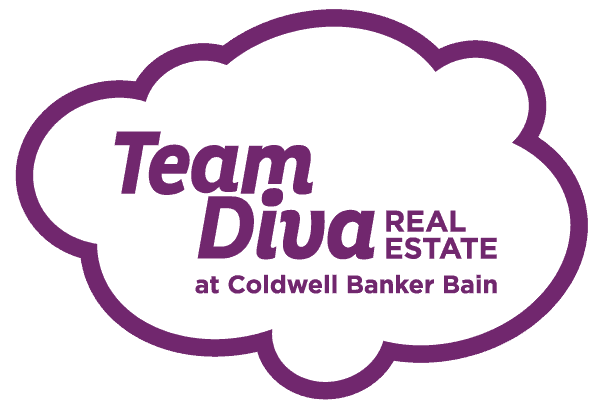 What’s Going on at This Fab Condo? Welcome to The Granada, located in West Seattle‘s Alaska Junction. If you have not explored the Alaska Junction, you need to visit and see what all the hype is about. The Alaska Junction has long been a core neighborhood on California Avenue, and home to diverse local businesses that cater to every walk of life. You will never lack for food options. Enjoy fine dining with a hearty steak at Jake’s Grill. Not in the mood for red meat? Try Mashikos, the award-winning sustainable sushi house. Bakery Nouveau and Husky Deli offer delicious baked goods and killer sandwiches when you’re looking for a quick bite. But there is much more than food. Easy Street Records is kicking it old-school with vinyl records, CDs and DVDs. Menache & Sons Jewelry has been adorning patrons for over 45 years, and Shadowland is a fun-filled night spot. Located just a few blocks away from all this goodness is The Granada. Perched on California Avenue, you are just steps away from all the action. Retreat back to a stunning two-bedroom, two-bath condo and enjoy peace and quiet. This condo is super spacious and boasts a beautiful view of the Puget Sound, right from the living room. Since the living room is southwest-facing, it gets plenty of natural light throughout the day. In fact, the various spaces of the condo receive light from every direction. Commuting in and out of downtown Seattle is a breeze. The Rapid Ride C Line is also located right on California Avenue for quick access. Is public transit, not your thing? Well, this unit has its own parking spot along with a storage unit. Cats are welcome here, so make sure you bring Fluffy along. What’s Going on at the Granada? Retreat to your private oasis high in the trees above Belltown. 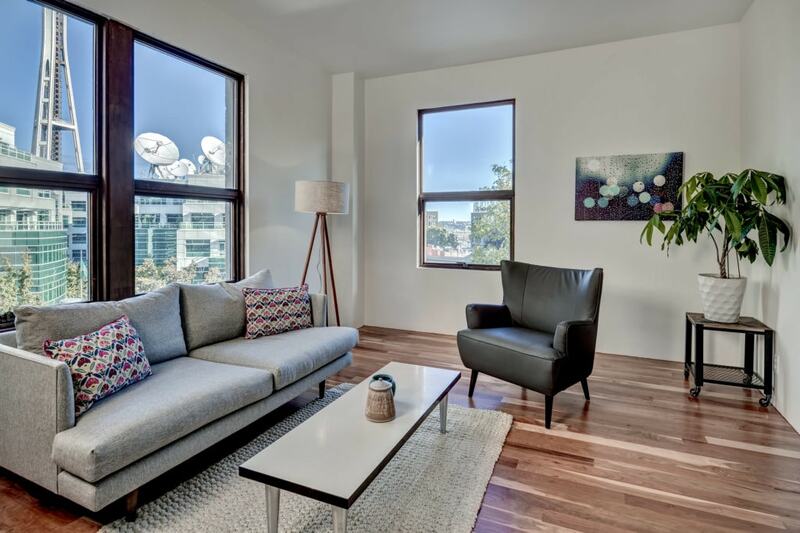 Entertain guests in your spacious living room with a full Space Needle view. It’s the perfect spot to watch New Year’s fireworks! Feel all warm and cozy with these true cherry hardwood floors throughout the kitchen and living room. This BRAND NEW kitchen with custom cherry cabinets, granite countertops and all new stainless steel appliances is ready to transform all your market goodies into delicious meals. Were you expecting a full-sized dishwasher at this price point? It’s here! 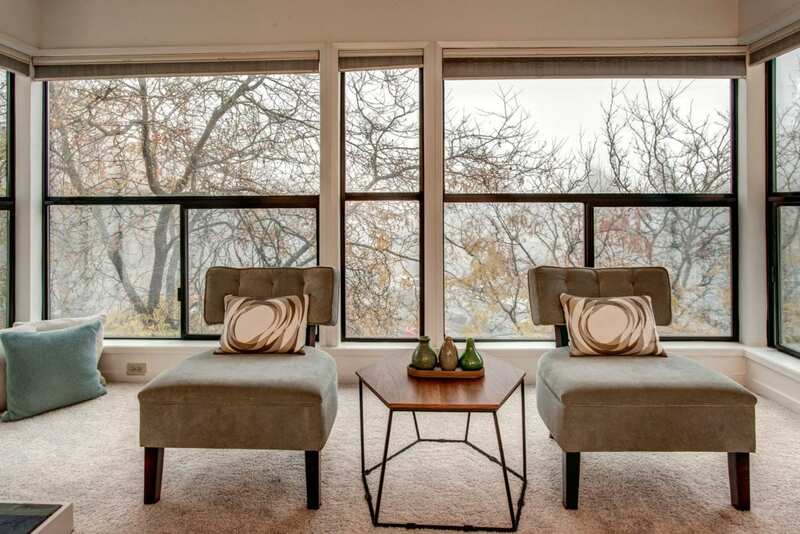 Massive light-grabbing windows allow you to watch the seasons change in the trees right outside while still allowing for total privacy from your neighbors. This home is the perfect pied-a-terre for someone working downtown who wants to escape Seattle for the weekend. With no rental cap and a six-month minimum lease makes this condo a great rental property. The HOA is very passionate about keeping the building maintained, while also keeping the dues in check. Fewer frills like wine lockers and pools mean lower monthly dues. Laundry is easily accessible in the basement along with some work out machines in the common room. That’s a nice touch. Want to impress your friends with downtown views? If the Space Needle view wasn’t enough, you can take them up to the roof, where you can show off Puget Sound, Downtown, The Olympic Mountains, and even Lake Union if you squint right. When I say this building is in middle of it all, I mean it. Nearly every bus running downtown can be picked up from 3rd Ave at Ceder St and from there you can easily catch the light rail to the airport. Headed East/West? Then walk to the other side of the block to pick up the #8. Moving around town could not be easier. Want to stay a little closer to home? Belltown has everything you need. Coffee, clothes, theater, movies, parks, museums, food, and booze are all steps away from the front door of 2700 4th Ave. At this price, it’s hard to turn down such an amazing value. What’s Going On in Belltown?